We are a wholesaler of consumer fireworks, based in Ellsworth, Wisconsin. We offer a full line of consumer fireworks. we carry the best items from each of the major brands (Brothers Pyrotechnics, Shogun, Cannon, Black Cat, Etc.) 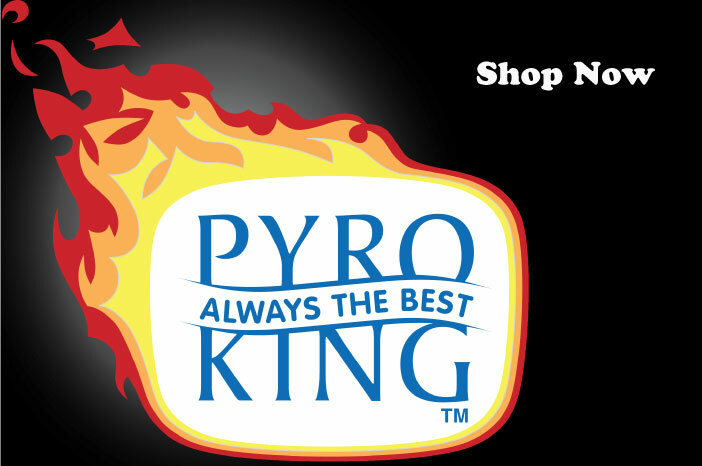 and feature our own exclusive brands, Pyro King, Pyro Valu, and Pyro Premium. Our wholesale price list contains over 800 different fireworks. We have more than 95 exclusive fireworks in our Pyro King, Pyro Valu and Pyro Premium brands. Note that online ordering does not provide pricing. To find out case prices and inventory status, please refer to the pricelist. After receiving your order, we will process it quickly and contact you with totals. The order can be adjusted easily at this time. Orders are shipped by common carrier trucks. Fireworks cannot be shipped USPS (mail), UPS ground or Fed Ex ground. We DO NOT send fuse or any other pyrotechnic supplies by US Mail, UPS Ground, or Fed Ex Ground. Contact us for shipping rate quotes. Charges are calculated by the weight of the order and the destination zip code. We use a number of different carriers and we will find the best rate to your area. Transit time varies from 1-5 days, depending on were you are located. Please contact us for a sample quote. Order must be prepaid in full before it is shipped. We accept cash, cashier’s checks and money orders, and all major credit cards. This merchandise is sold and shipped on the representation of the buyer that the merchandise will be used strictly in accordance with all applicable laws of the state, county, city or other municipality of the destination. We carry the best items from each of the major brands (Brothers Pyrotechnics, Shogun, Cannon, Black Cat, Etc.) and feature our own exclusive brands, Pyro King, Pyro Valu, and Pyro Premium. SHop by Brand, Pyro King, Brothers, Shogun and more..
Shop by Category. Assortments, Motor Tubes, 500 Gram Cakes, etc. Copyright © 2019 Victory Fireworks Wholesale .